I am excited and a little nervous to be writing this blog post. 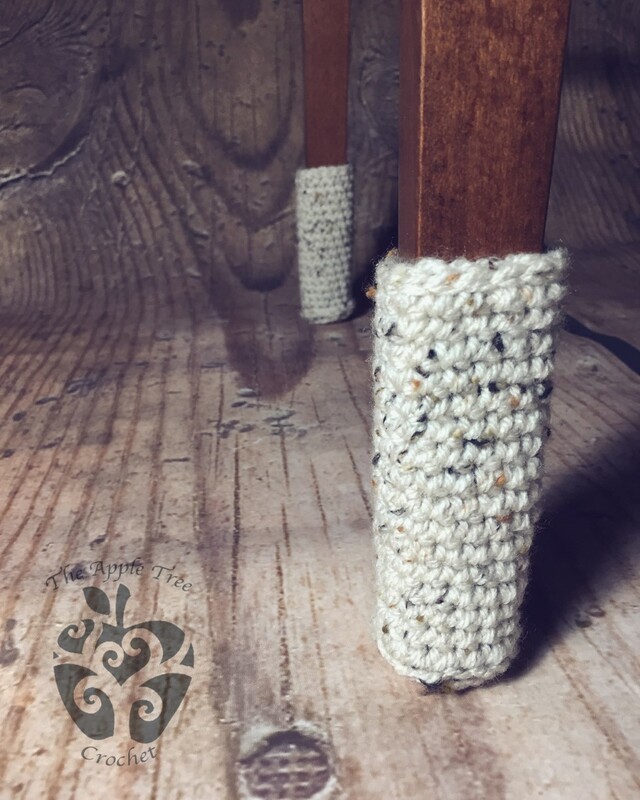 I have wanted to blog and share my patterns and newly learned knowledge for crocheting for the longest time now, but the idea was kind of overwhelming for me. Where do I start? What do I write about? Will people like it? Will it be useful if there is already information exactly like it on the world wide web? One of the many projects that I currently have on the go is......you guessed it. Chair Socks. A friend messaged me a picture of some chair socks that her cousin saw and liked and asked if I could make ones similar to them. Of course I said "yes" (probably because I have a hard time saying no) and also because I LOVE coming up with my own patterns just by looking at a picture someone sends me or from an idea or request that someone has. Finished chair sock measurements will be 5" circumference by 4" height. If you prefer you can also begin with ch 3 then sl st to beginning ch to create a starting circle. This pattern is worked in continuous rounds using a Stitch Marker at the beginning of each round to help guide you. Rnd 2: sc into first sc of first round and PM, sc into same stitch. Rnd 16: sl st all the way around, st sl at the end of the round and pull yarn through, cut and weave in tail. That's it! Now all you have to do is make enough for all of your chairs. Phew! I did it. My first blog post. My goal is to write one blog post each week, so be sure to check back for more free patterns. Please feel free to leave any comments or questions for me. Thanks so much for sharing this! Exactly what I need for my new floors in my home.